ez1095 2015 software is very easy-to-use and affordable. Customers can download and print ACA forms 1095 and 1094 without learning curve. 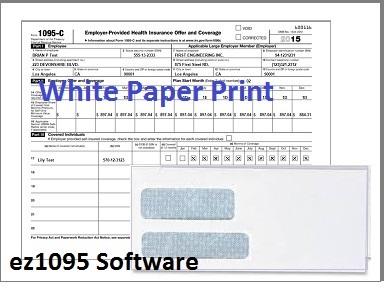 Chicago, IL (1888PressRelease) March 16, 2016 - HR managers and tax professionals that need to mail out 1095 ACA forms before deadline in Year 2016 should try out the new ez1095 software from halfpricesoft.com (http://www.halfpricesoft.com). ez1095 can print form 1095C, 1094C, 1095B and 1094B. It has also been approved by IRS to generate the efile documents that customers can upload to IRS for ACA form electronic filing. Some new features in the latest edition make it easy to mail out forms. - Customers can use white paper printing feature for both recipient copies and IRS copies. No pre-printed form is need. - Customers can print 1095C and 1095B form in PDF format and email form to recipients. - Customers can choose the option to print mailing address with forms. So they can mail the form in #10 double windows envelopes easily. "ez1095 2015 software is very easy-to-use and affordable. Customers can download and print ACA forms 1095 and 1094 form without learning curve." said Dr. Ge, the founder of Halfpricesoft.com. ez1095 software is compatible Windows 10, 8.1, 8, 7, Vista, XP and other Windows systems. Designed with simplicity in mind, ez1095 software is easy to use and flexible. ez1095 software's graphical interface leads customers step-by-step through setting up company, adding employees, add forms and print forms. Customers can also click form level help links to get more details regarding the software.